The beautiful and natural environment of KhaoLak and it's surroundings, including nearby land and marine based national parks, offer a wide range of interesting and varied activities for everyone to enjoy including canoeing, rafting, diving and snorkeling, safaris, elephant trekking, and of course hiking. Khaolak-Lamru national park partly encompasses Khao Lak, and is ideal for hiking, forest walks and viewing wildlife. It offers tropical evergreen forest, granite mountains, hills, beaches and sea cliffs, and a fairly varied selection of flora and fauna considering it's size. Four waterfalls are popular. There are also coastal trails, near the Park HQ, on the picturesque headland of Leam Hin Chang. The national park of Khao Lampi - Thai Muang lies about 24km south of Khao Lak, and covers two distinct regions. Thai Muang is a long narrow coastal and mainly beach section, famous for turtle conservation. Tropical evergreen forests cover the hilly and fairly mountainous regions of Khao LamPi. Here, there are several hiking opportunities and two interesting waterfalls. There are four picturesque waterfalls at Sri Phang-Nga national park, which lies 65km north of Khao Lak, and avails itself to good hiking trips. This park is fairly large, covering 240 sq km., and is fine virgin evergreen forest, with numerous hills, streams, and a few outcrops of limestone cliffs in the east. The park provides a basic campground and toilets, but visitors should bring their own equipment. The spectacular 645 sq km Khao Sok national park, is in neighbouring Surat Thani province. It features thick native rainforest, punctuated by towering outcrops of limestone karsts, sparkling streams, an island studded lake, several caves, many trails, a vast range of flora and fauna, and at least eight popular waterfalls. Hiking is almost unlimited. The Similan Islands in the Andaman Sea are world renowned for excellent diving and picturesque sandy beaches. Inland, the nine islands are mostly relatively low lying formations with some thick forest and a few hiking trails. In particular, Ko Similan (the largest island) is good for hiking, and exhibits the largest granite outcrop; this distinctive formation offers sweeping views from the top. In addition to the superb marine attractions of the Surin Islands, the inland evergreen rainforests are also quite popular for hiking and trekking. The north island (Ko Surin Nua) supports the most nature trails. The fauna is quite varied and the eighty recorded bird species include the rare Nicobar pigeon. 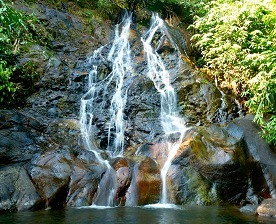 There are indeed many beautiful and picturesque waterfalls in the vicinity of KhaoLak. Please refer to our National Park guides for more details. For more details of waterfalls and hotsprings in the Kapong area, please see our Kapong webpage. Close to Pakwib beach at marker 70 - 71 km on highway 4. Almost opposite the turning to Pakwib beach, head east inland towards the tambon (sub district) of Bang Sai, and make a right turn after about 1 km. Follow the cement road for 1.8 km and then walk 30 meters to the waterfall. (It is about 3 km from route 4). The fall of the water is about 60 m. There is good swimming but use caution. In Khaolak, there is an elephant camp and trekking at Asia Safari which is situated close to marker 54 on route 4 (near the "original" KhaoLak beach). Also in Khaolak there is the Khaolak Elephant Camp. In addition to elephant trekking, they offer snake and monkey shows, and rubber tapping demonstrations. Some of the excursions allow you to spend time with the elepants in the form of elephant bathing. At Ton Patiwat there is a Wildlife Preservation Centre, which encompasses a forested area with brooks and small waterfalls. Elephant trekking is one of the highlights of tour programs at Ton Patiwat. Several local travel companies offer fun eco-tourism trips here, for all age groups. The Centre is located in Tambon Song Praek, between the route from Phang Nga Town to Amphoe Kapong. To get there, To get there, travel 5 kilometres from Phang-nga town along Highway no. 4, then take a right turn at Ban Song Phraek for 10 kilometres. But the most adventurous elephant trekking takes place at Khao Sok National Park, some 80 km from KhaoLak. Khao Sok National Park is a truly outstanding and amazing experience, offering all kinds of activities. The main limiting factor will probably be your stamina. Elephant trekking through streams and along tracks close to meandering rivers in the midst of the jungle, is perhaps one of the more leisurely activities. There are various other adventure tour itineries for Khao Sok National Park, covering from one to four days. Many tour operators offer bamboo rafting at Khao Lak National Park. Usually the activity is combined with elephant trekking. This is typically at Ton Pariwat wildlife conservation area on the south-east extremities of the Park. Bamboo rafting and canoeing are also available at Khao Sok National Park. At Kapong there are hot springs and an associated natural pool at a temperature of 65C. Kapong is on route 3090, and you will pass close to the springs if you visit Lam Ru and Hin Lad waterfalls in Khaolak-Lamru national park. Hence you could easily combine the trip. Ban Bo Dan hot springs are located a few kilometers south of Thai Muang town. The waters have quite a high mineral content, including calcium and sodium, and also various iodides and chlorides, and are of course popular for relieving stress, arthritis and promoting skin care. One can just lie there for hours and soak up the goodness!